Brookings, S.D., residents and donors Barb and Van Fishback stand outside the newly named Jeanine Basinger Studio located on the campus of Basinger’s alma mater, South Dakota State University. South Dakota State University (SDSU) recently named a studio in honor of Jeanine Basinger, the Corwin-Fuller Professor of Film Studies and special advisor to the president. Basinger has a bachelor’s and a master’s degree from SDSU and is a former resident of Brookings, S.D. The South Dakota Public Broadcasting (SDPB) Jeanine Basinger Studio, located on SDSU’s Brookings campus, enables professional, high-quality sound for guests and interviews. 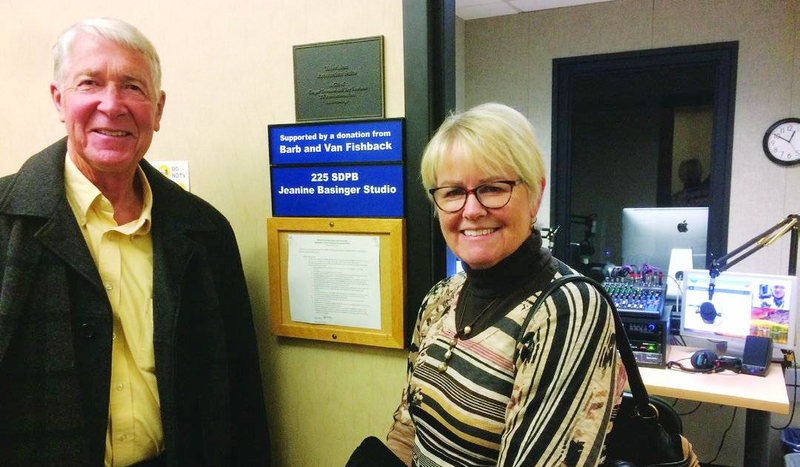 The Basinger Studio was funded by Brookings residents Barb and Van Fishback.